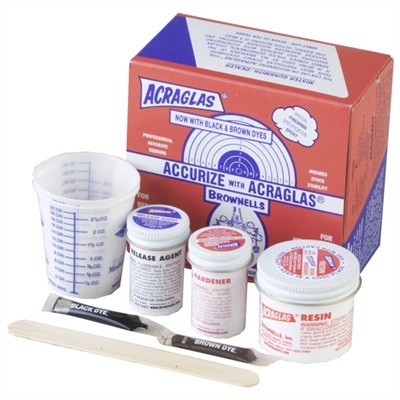 Brownells’ Acraglas is a very cool adhesive that will stick anything to anything, and you don’t need wizard skills to apply it. In life you have to be able to stick things together, whether it’s for fun, work, or out of desperation, it's an important ability to have. Many years ago human beings realized that their bodies could not produce a substance that could achieve this, so glue and adhesives were invented. Today we have lots of great adhesives to choose from, but for some you have be some kind of magician or scientist to use. Acraglas is manufactured by Brownells, a super cool company that provides just about anything you need in regards to firearms. It’s the go to place if you want to tweak your burner. Acraglas was originally designed for bedding rifle barrels, but it will fulfill all of your sticky needs, and it’s easy to use. Just mix equal parts hardener and resin until they homogenize (takes a little over a minute) then apply to your ready prepped surfaces and stick it. Let it cure and you've got an unbeatable bond! So remember my old saying "don't get stuck with things that won't stick" and head over to Brownells.